Emma May is a British/American Crochet designer and founder of Pippin Poppycock. 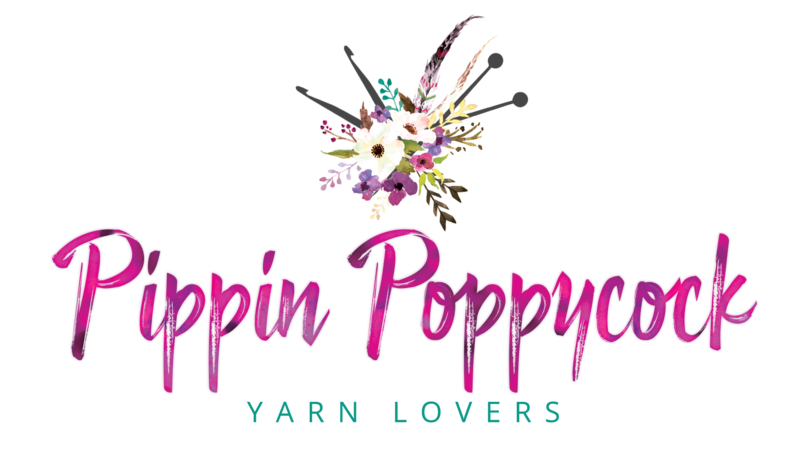 Pippin Poppycock is a crochet and knitting website showcasing innovative and unique patterns. Emma has a distinct eye for color and detail, and regularly holds live online sessions to assist with any questions. Her patterns and designs have been recognized by some of the leading yarn companies. Aside from her passion for crocheting and knitting, Emma enjoys spending quality time with her family, cooking, reading and daydreaming. Sarah has been with Pippin from the beginning and is my rock in all matters. Sarah lives in Plano, Texas. Wife to her college sweetheart and mother to her beautiful, hard headed 4-year-old daughter Hannah, Sarah loves to work with Caron Simply Soft and her favorite color is Mint. Her passion is crochet, but she also loves to sew and when she finds the time she gets creative with her Cricut machine. Sarah’s goal for 2019 is complete all her WIPs and trust me, she has more WIPs than I do shoes! Michelle is bright and bubbly and can always bring a smile to any situation; she is often my voice of reason. Michelle lives in Portland Victoria, Australia. Michelle keeps busy with her two adult children, two teenagers and one granddaughter. She loves most crafts but her devotion is to crochet and bobbin lace. She loves the color blue and her go to yarn is Stylecraft Special DK. Michelle was in a car accident at the beginning of 2018 and her goal for 2019 is to gain full control of her left arm. Claudia is our mother hen, often known to bestow her sage wisdom when life throws us a curveball. Claudia lives in Opoeteren, Belgium and speaks Dutch, German, English and can understand French. Her fiber of choice is Scheepjes Cotton Catona, it took me months to convince her to try acrylic. Her favorite project to date is the Queen Mandala by Annemaria Esterhuizen. When she’s not crocheting or babysitting her 3 grandbabies she can be found walking in the great outdoors or embarking on an adventure in her camper van which she plans to do a lot of in 2019. Sheena is my go-to person on all things fiber. Sheena is originally from Los Angeles but now lives in North Tyneside in the North East of England with her British husband and her two young children. Sheena is passionate about her plant-based lifestyle and when she is not Crocheting, Knitting, Spinning or dying her own yarn, she is in the kitchen whipping up new vegan recipes. Sheena’s goal for 2019 is to finally complete her Mandala Madness by Helen Shrimpton almost 2 years since she started! Darlene is the CAL queen. Want to know about a CAL? Ask Darlene! Darlene lives in Buffalo, New York. Her go-to yarn is Stylecraft Special DK and she loves the colors of the ocean. Darlene loves to crochet blankets for her local hospice and when she is not crocheting or working, she is planning her next adventure. Darlene loves to travel around the United States, Canada and Mexico in 2019 her goal is to travel to Europe. A true Gypsy Sprit. Hayley is fun and carefree, and her attitude toward life is infectious. Hayley lives in Hampshire in the south of England. She is Nan to six beautiful granddaughters and loves all things pink and sparkly; she has even been known to have pink hair! Most of us have a craft room or corner but Hayley has a craft house! She loves knitting, crochet, sewing and paper crafts and collects notebooks. Her goal for 2019 is to be a lot thinner, win the lottery, and open her own yarn/craft shop. One that we can all relate to! Oh sweet, sweet Jeni. Jeni’s antic’s always have me laughing. Jeni lives in a quaint cottage in the Royal Forest of Dean, England. She is an avid gardener and if her hands are not entwined in yarn, they are deep in the dirt. Her go to yarn is Drops Safran in an array of greens. A true Earth Goddess. If she is not crafting or gardening she can be found bargain hunting in antiques stores. Jeni goals for 2019 are to finish restoring her 400-year-old cottage and to convince her farming neighbor to let her have some alpacas. Shauna is our newest and youngest team member. Shauna juggles the day to day tasks of being a wife and mother to her one year old daughter, cramming in her love for crochet and knitting whenever she can. Her favorite make to date is her Sophies Universe by Dedri Uys. Her goals for 2019 is to build her knitting needles collection and to complete all her wips. Have a question for us. Don’t hesitate to ask.